Bert has been told that members of his branch of the family have been professional Punch and Judy entertainers for more than a hundred years. Staddons were very recently and perhaps still are performing the show in Weston-Super-Mare in Southwest England. Note the royal crest on the front of the show. According to Bert, this signifies that it has been performed for royalty. 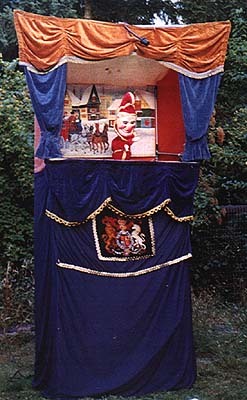 Visit Bert's site for his perspective on Punch & Judy and lots more. Bert has also provided photos of Punch and Judy enamelled thimbles from his collection.